Double D Ranch and Peyote Bird reimagine classic southwest styles like squash blossoms, najas and stamped silver in two new jewelry lines that pay homage to indigenous artisans. Double D Ranch and Peyote Bird Designs have made a beautiful, bold statement with their newest line of jewelry. 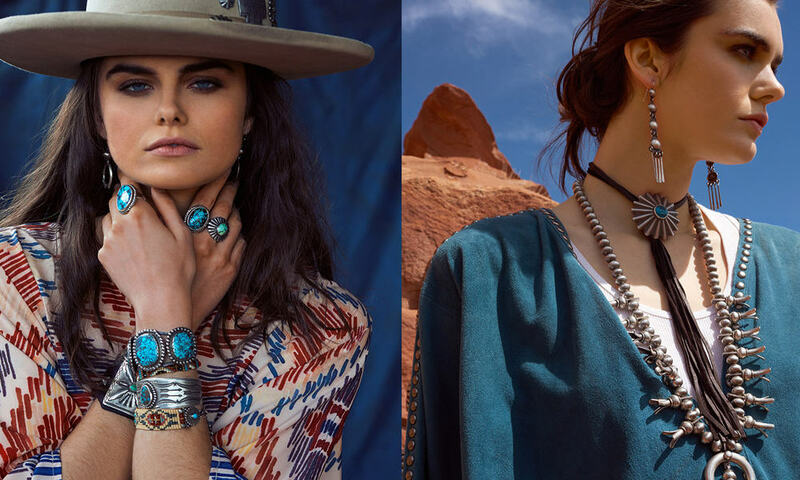 Double D Ranchwear joined with Peyote Bird Designs of Santa Fe to create the DOUBLE D RANCH Jewelry Collection, divided into two assortments. The Traditions Collection, based on vintage pieces inspired by DOUBLE D’s archives will feature heritage icons such as squash blossom necklaces, chunky turquoise cuffs, ketohs and signature earrings. The Seasonal Collection will align with DOUBLE D’s apparel offerings and will be color and trend driven to include southwestern ID tags, drops, chokers, bracelets and earrings. Prices will range from $88 to $1,800. Shop the collection at ddranchwear.com.